The past 10 days saw Paul Brisso and good friends, Steve and Lisa Dahmer, on safari with John X Safaris in the Eastern Cape. Both Steve and Paul had previously hunted in Namibia, but neither men had ever hunted in South Africa and had certainly never hunted any of the terrain or variety of species that the East Cape has to offer. For Lisa it was to be her first trip to Africa – and what a dream first trip it turned out to be. Paul, Steve, and Lisa were joined by Professional Hunters, Carl van Zijl and Juan MacDonald, together with their trackers, Boy and Steven. The guys were set to do most of the hunting, while Lisa was along for the experience and would end up doing a bit of hunting herself too. 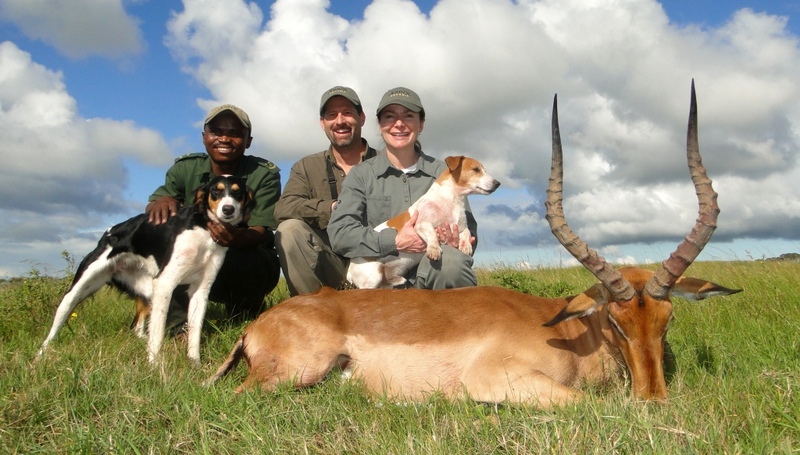 In fact it was Lisa who got us all off to a great start with a fantastic first day Impala! Paul, together with Carl and Boy, were on the hunt for Nyala from our Coastal Area. 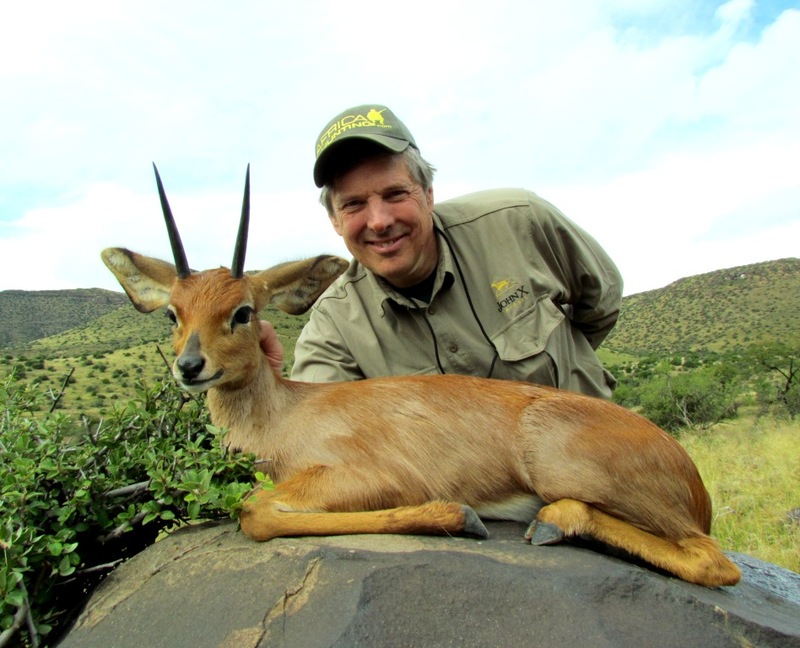 Nyala and Lechwe were Paul’s priorities on his hunt and we were set to hunt hard in order to achieve above average trophies on both these species. We saw a number of Nyala bulls that first day, but never spotted what we had set our goals on. Late that afternoon we spotted a good bull and the hunt was on. While the bull was rutting hard and seemed to be in a fairly good area to attempt a stalk, we never realized there’d be 200+ other eyes we’d have to avoid first to get within shooting range. First it was the Zebra, then some Impala, and when we thought the coast was clear, a very ambitious rutting Warthog decided that the 3 figures crawling through the tall grass looked very similar to 3 prime Warthog sows. To say the least, never doubt the instincts of nature! After ensuring our dignity was all kept intact and the Warthog had received a clear message, we were finally in range. Paul settled onto the sticks, but wait, another distraction. This time a super Kudu bull walked out a 100 yards ahead of us, and further up along the ridge a great Cape Bushbuck. Like the saying goes; when it rains, it pours! With so many options, we decided that Paul should make the call. A fantastic call it turned out to be! The following day saw Steve and Lisa on the hunt for Nyala too. Nyala was a big priority for Steve, together with anything else outstanding. Paul and Carl headed out in search of Lechwe. The morning was a misty one, making visibility near impossible. 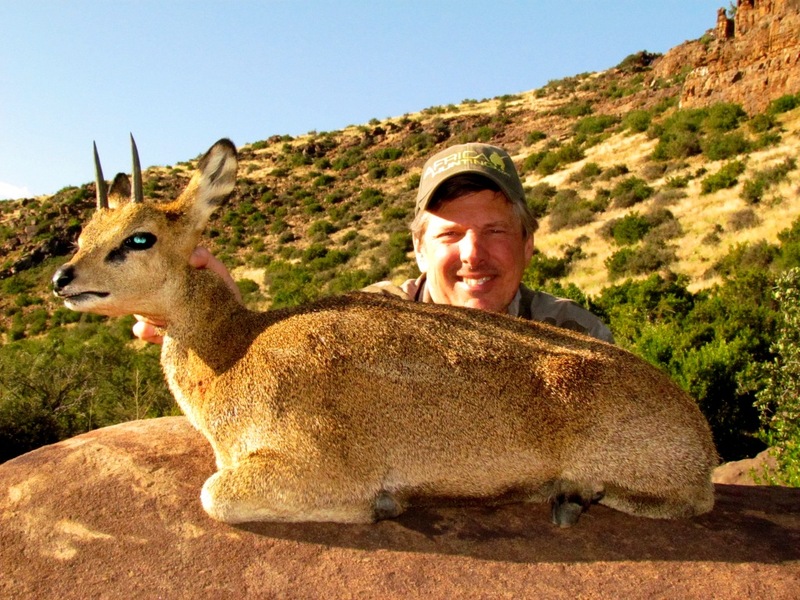 By midday the hunters had spotted a number of good Lechwe bulls. An old bull resting up in the shade of an Acacia Tree was spotted during the early afternoon. After a short debate between the hunters, it was decided that the lone bull in question was meeting the standards that the hunters were after. Boy was left on the adjoining hill to keep an eye on the bull while Carl and Paul got down into the valley. At first the hunters battled to find the bulls resting place, when they finally did, luck was at hand as the bull had not moved an inch. Paul got in position and the long wait began. At one stage another good bull came by and nearly had us taking a closer look at him. 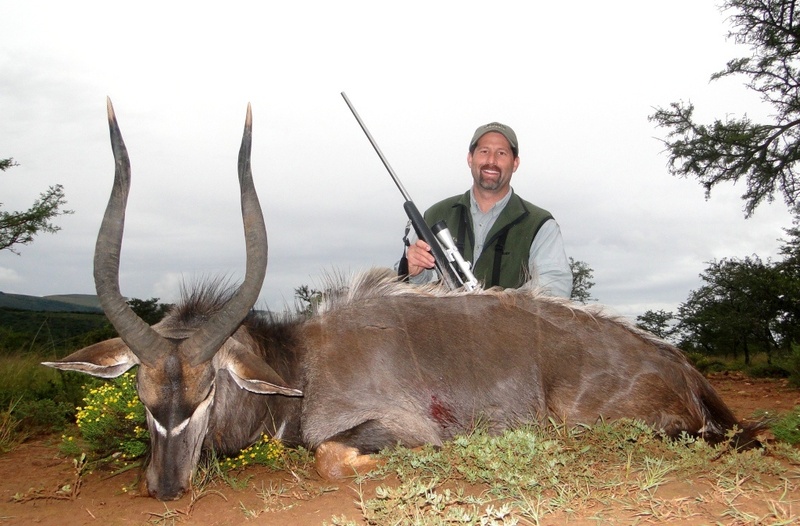 In the end patience prevailed and Paul bagged a truly massive Lechwe! Juan, together with Steve and Lisa, spent most of that second day at this exact spot. The secret was to glass hard and be patient. The team spotted a number of Nyala and tons of Waterbuck during the course of the day. Early afternoon saw Bushbuck becoming active. 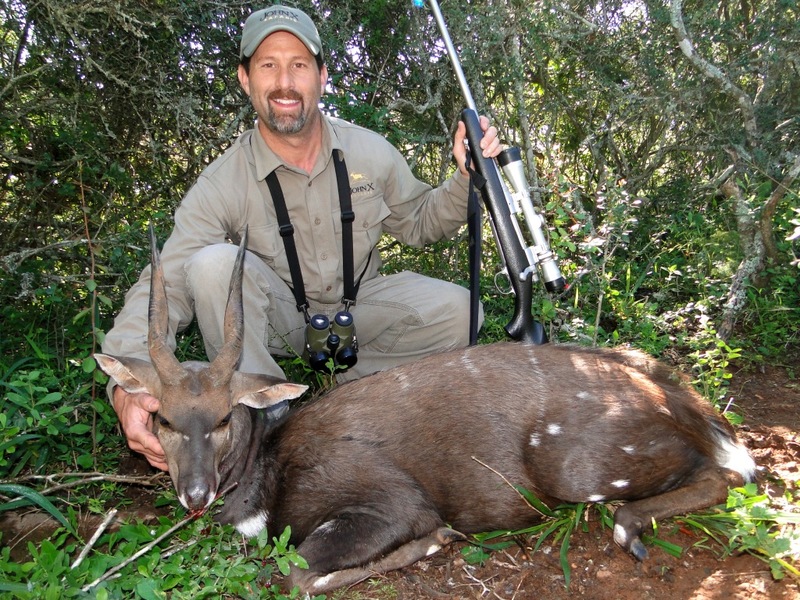 It wasn’t long before the action kicked off with the spotting of a monster East Cape Kudu. The hunters made a dash for it, hoping to catch the bull feeding in a clearing before heading back into the Coastal Forest. Unfortunately, it was not meant to be, but from that moment on it was evident that Steve had lost his hart to a truly magnificent trophy that had gotten away. Day three saw us rising to fantastic weather, and a day where Paul’s luck just continued where it had started off two days earlier. 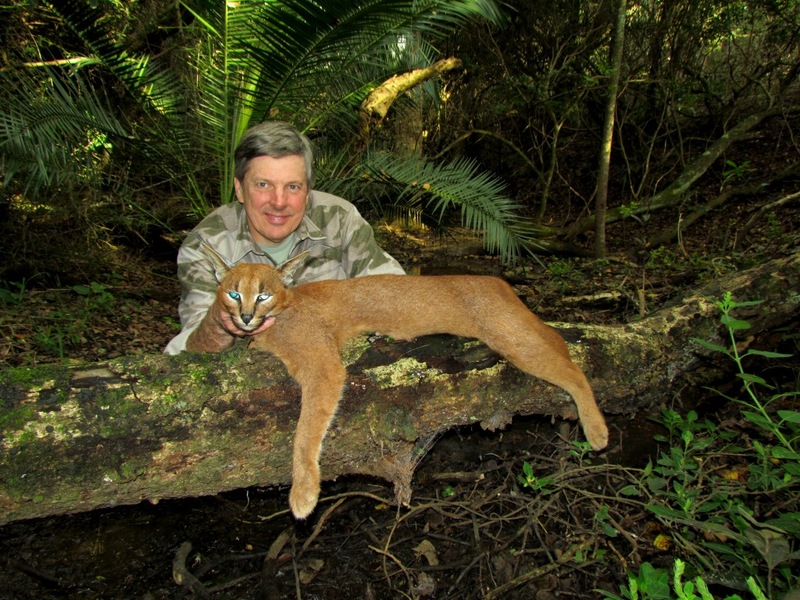 The hunt was on for Caracal. We decided to head down towards the coast in order to find some much needed moisture for the hounds. The hounds were soon onto a track, clearly enjoying the favorable hunting conditions. Paul’s cat was treed and he obliged with a clean one shot kill. Steve was still on the hunt for Nyala. They were spotting bulls, but nothing that took their fancy. Carl and Paul decided to join the rest of the team for the remainder of the day, hopefully lending a hand in spotting a trophy Nyala bull. While on their quest to help with the Nyala hunt, the two of them together with Boy, decided to approach a quiet area where Nyala had been known to have been seen in the past. A few Nyala females were spotted immediately, but no bull. The hunters waited out the afternoon, hoping to find a bull for Steve. At dusk, just as the guys were calling it a day, this super Common Duiker stepped out no more than 25 yards away. Up until that stage, Paul hadn’t expressed any interest in the “Tiny 10”. With the bagging of this monster Common Duiker and Carl’s passion for hunting the “Tiny 10”, Paul was soon interested in these often overlooked little guys. While Paul was enjoying the worlds luck, we knew it was only a matter of time before Steve got lucky. And how lucky he got! The smile on the face was one of joy and sure relief. Keep in mind he’d been hunting Nyala for 3 days solid. He had been on the sticks twice previously during that period, always lucking out at the last minute. So when we rose to a rainy East Cape morning that 4th day, both Juan and Carl felt it was maybe just the thing we needed – let the bad luck rain out! The rain bucketed down for 3 hours without a break, and then suddenly stopped for 30mins. That’s all Steve needed! That afternoon saw a happy crew heading north to our Northern Camp. They could look forward to an entire new challenge, with new species and terrain that stretched as far as the eye could see…..
A rejuvenated Steve and Lisa, still living on the memory of the previous day’s excitement got us off to a flying start with this super Common Springbuck. Paul’s newly found interest in the “Tiny 10” seemed to grow from strength to strength. His first trophy in the North – A world class Steenbuck. When Steve first told Lisa about their hunt to John X Safaris, he had asked her what the one trophy was that she wanted to hunt most of all. Without hesitation she said the biggest one possible! It was therefore agreed at the outset, that if we could find a really good Cape Eland, Lisa would be the first to give it a go. Lisa in the meantime was patiently waiting in the wings. This point of the safari had been something that all of us were working towards. Everyday saw us concentrating a bit harder, looking for that extra special Eland. After all, we weren’t about to shatter a little ladies dreams. 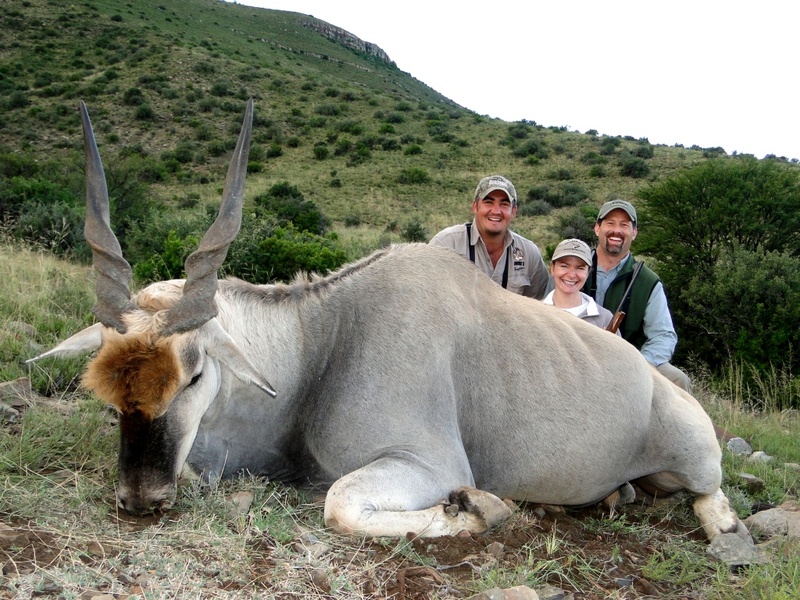 When we finally found a bull we all felt met the ultimate Eland criteria, it was as if destiny was bestowed upon Lisa and her little gun. The stalk was intense – through valleys and across gorges- the first look on her face as we put her on the sticks and showed her the big old blue bull feeding in the shade of a Wild Olive tree. The perfect shot and the excitement of her joy. The smiles tell a story of a day of success, but the feeling of knowing that we were part of a dream come true is something that will stay with all of us for a very long time. Paul having enjoyed the pleasure of joining Lisa on her Eland hunt was ready to get back out hunting himself. The excitement was literally infectious. 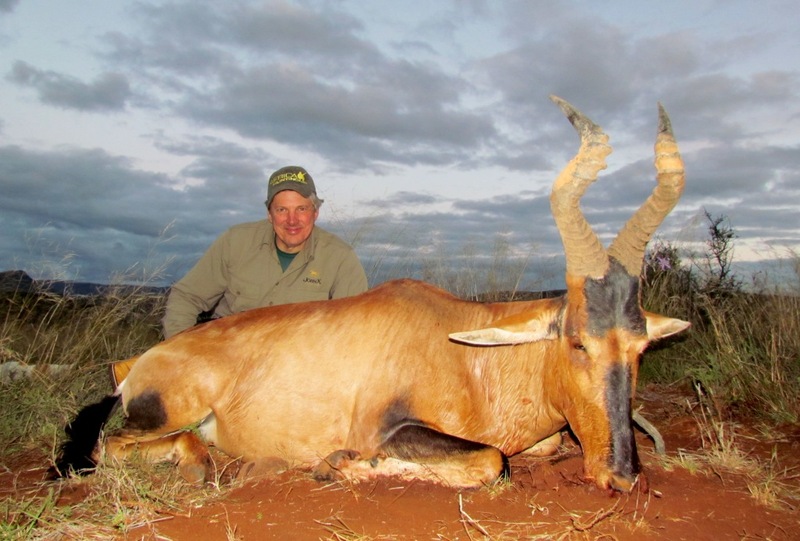 While Lisa really worked hard for her Eland, it was as if it was a sign of things to come. We first spotted a lone Cape Hartebeest bull on a particular mountain slope the very first afternoon in the north, but never took serious notice of him. There was so much to look at and even more to see much closer, we never bothered to follow up. A few days later while glassing the same hill, our tracker, Boy, noticed the same bull resting in a sunny secluded valley. At a distance he looked good, a closer inspection with the spotting scope confirmed he was a beauty. We started our climb at 9am and unfortunately spooked the bull at about noon. We decided to head back for lunch and let the Hartebeest settle down during the midday heat. We were back out at 2pm and on the trail of our bull once again. By late afternoon, we were yet to catch up to him when help came out of nowhere. Juan, together with Paul and Lisa, were on the opposite ridge to us, looking for Black Wildebeest. They could see the Hartebeest was a mere 200 yards below us, just out of our sight. 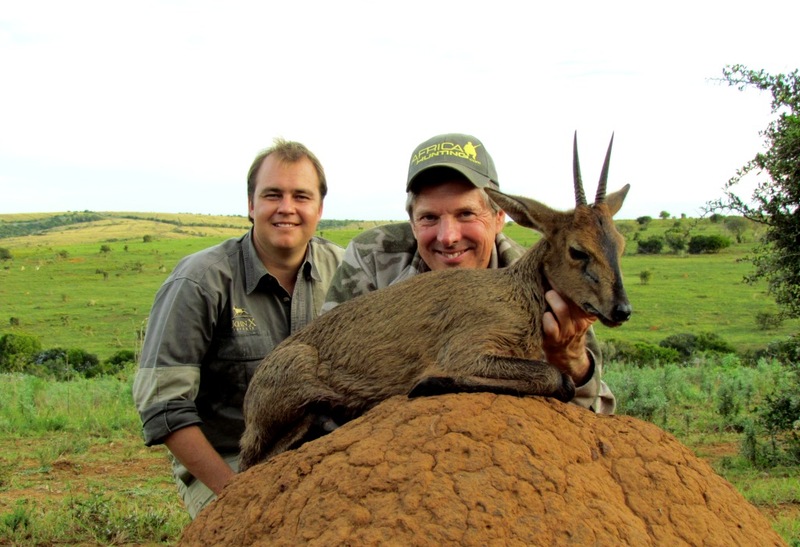 Paul and Carl made the final stalk and finally earned a fantastic Cape Hartebeest right at sunset. What a day it turned out to be. Both Lisa and Paul were enjoying their share of the action; Steve in the meantime wasn’t going to be left behind. 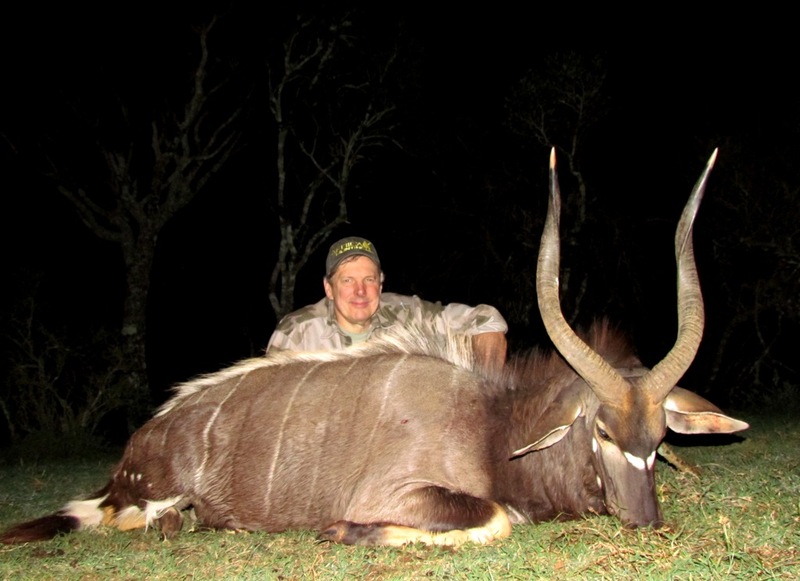 He bagged this beauty of a Black Wildebeest, but not before earning a few blisters on his hands and knees leopard crawling over some rough terrain. While hunting in the north, and Paul having discovered a new interest in the “Tiny 10”, the suggestion was made that why doesn’t he pursue Klipspringer? Paul really enjoyed the mountains; with this we could think of no better species to compliment his love for mountains and hunting. 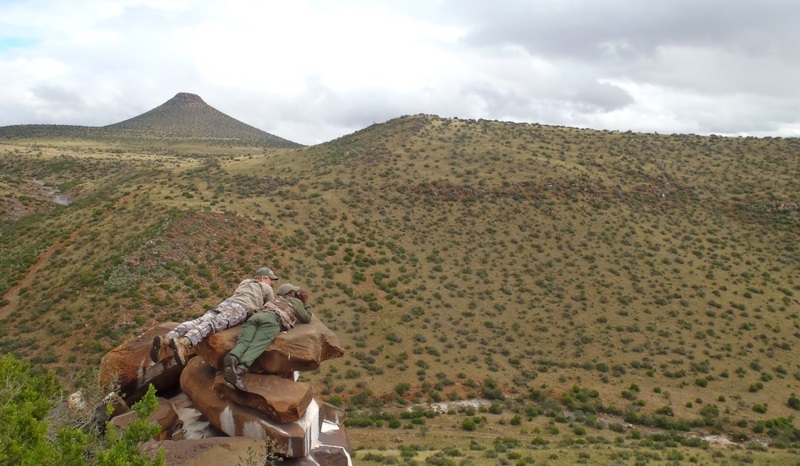 It set of a 3 day glassing and hunting marathon…..
Our first few days in the north saw us spotting Klipspringer on a regular basis. As “Murphy’s Law” would have it, the minute we started hunting for them, the weather blew in some rain, and the Klippies were nowhere to be found. 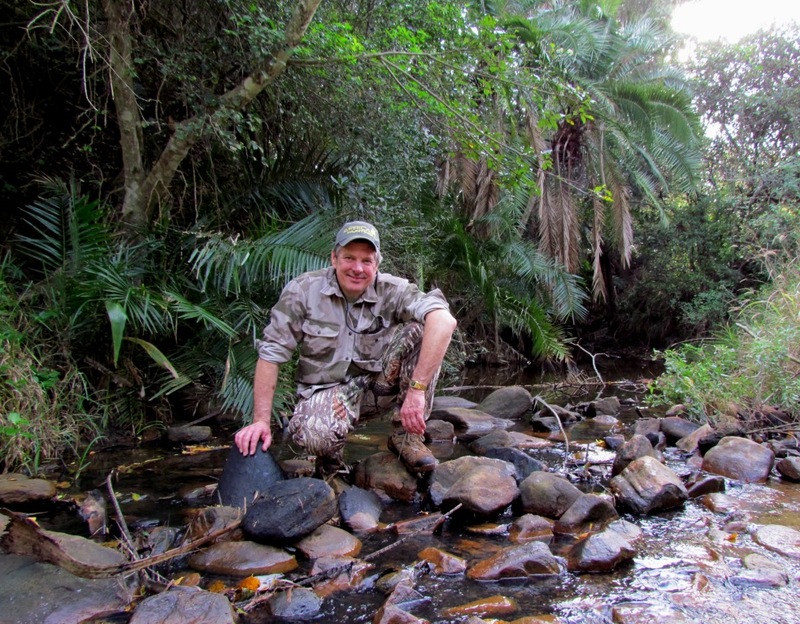 Day 4 on the hunt for Klipspringer – The weather and our luck finally turned. Paul made a fantastic shot at 250 yards to bag the 3rd species in his “Tiny 10” collection. It ended our hunt in the north and we headed back south for the last few remaining days hunting from our Coastal Area. Back south saw Steve pushing hard at trying to find the Kudu that had gotten away, and Paul was pretty much done hunting for this trip. Steve having hunted hard for 3 days in search of that 2nd day monster Kudu, couldn’t find anything similar to the one that had stolen his hart. 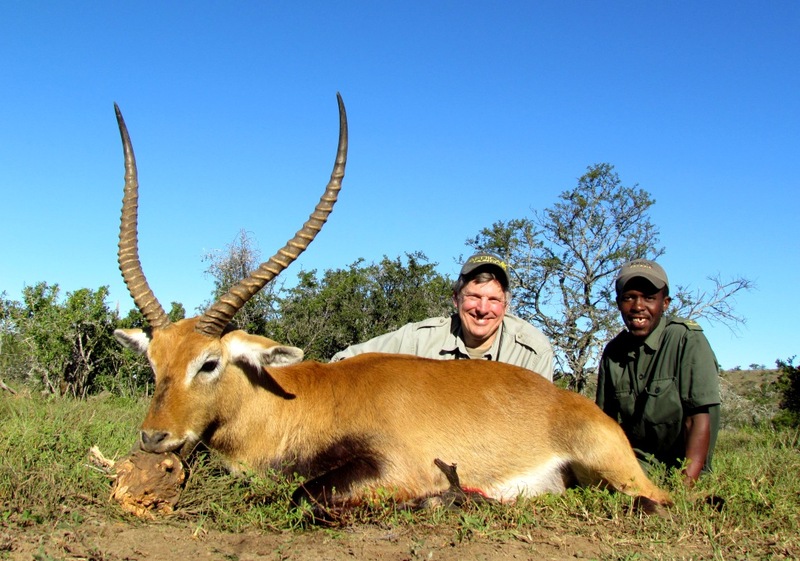 In the end he decided on a great Cape Bushbuck to complete his and Lisa’s spiral slam. Paul, Steve, and Lisa, it was a pleasure having you. From days out in the field to chilly evenings around a crackling campfire, every minute was as enjoyable as the last. Who knows when or where we’ll meet again? 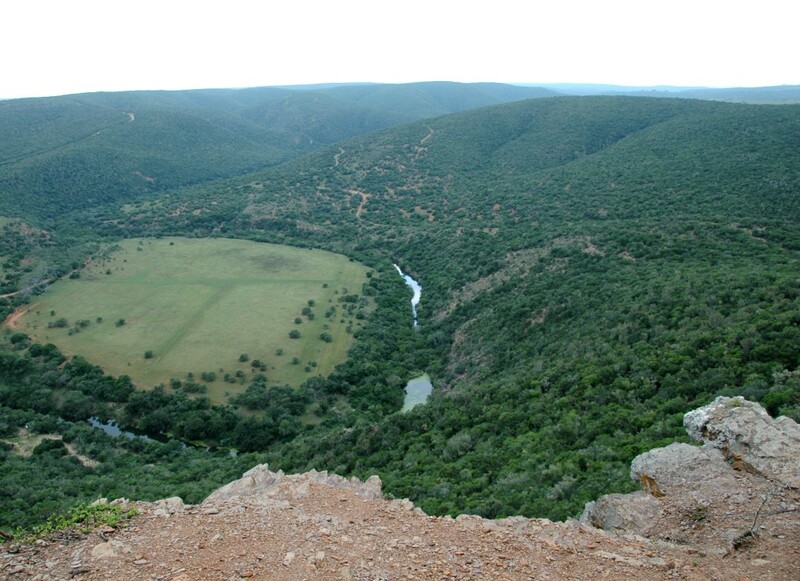 We’ll be sure to be on the lookout for a certain Kudu and Bushbuck that may have you day dreaming more than usual…..